Promoting Research and Education at the VA Ann Arbor Healthcare System since 1991. For more than two decades VERAM has partnered with the VA Ann Arbor Healthcare System to promote research investigating a variety of ailments afflicting our nation’s Veterans. In the coming years we will expand our activities to match the increasing need for Veterans’ care. 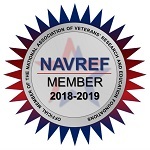 The foundation’s continued goal is to enhance the VA Ann Arbor Healthcare System’s researchers and healthcare professionals access to programs and resources that will increase their research capabilities and learning experiences in order to maximize the care they provide to our Veterans and their families.